When Citizens Bank of Edmond in Oklahoma sold some of its branches to another financial institution, it needed a way to maintain engagement with existing customers whose brick-and-mortar location options had changed. The solution? The interactive teller machine (ITM). This high-tech, high-touch platform enabled the institution to continue offering customers a convenient banking option without opening full replacement branches. “We wanted to have a way where we could still connect with our customers even though we weren’t going to have a physical location available for them,” says Jill Castilla, the bank’s president and CEO. Customer convenience was a primary factor behind United Bank’s decision to deploy ITMs. The 110-year-old community bank based in Zebulon, Ga., operates in a number of counties surrounding Atlanta and other nearby population and job centers. Rather than risk losing customers to other banks with branches located deep within the job-intensive areas of the region, ITMs enabled United Bank to provide the convenience of banking when and where it made sense. Bank customers increasingly expect that kind of anytime, anywhere access. Whether it’s placing pizza orders online or asking questions of a retailer through a live chat application, today’s consumers are embracing the digital realm with astonishing speed. The team at Houston-based Cadence Bank saw the impending technology shift as a way to gain a competitive advantage. ITMs “seemed to fit with how we visualize our desire to be a more digital bank and to have a more integrated customer experience,” says Dann Lee, SVP of retail delivery. Setting themselves apart from others in the market was important, but it wasn’t everything. “We also thought it might provide us some opportunity to extend our reach,” Lee adds. By deploying ITMs, the bank has extended its hours and established a presence in locations where building a branch didn’t make sense or wasn’t possible. From managing cost efficiencies to overseeing prudent real estate decisions, ITM technology has handily addressed a number of internal and external issues. A leader in the ITM space, NCR Corporation saw an early use for interactive technology as the country emerged from the recession of 2007-2008. It was a difficult period for community banks, and Jed Taylor, general manager of interactive banking at the Duluth, Ga.-based technology powerhouse, says many financial institutions were looking at their five-year plans with new eyes. “At that time, we saw a lot of people looking to create branches in a much more economical way,” he recalls. ITMs have further taken hold as financial institutions continue to pursue revenue generation opportunities that spring from improved consumer experiences, such as “creating extended hours or creating locations where they wouldn’t normally have a branch,” Taylor says. Rarely does a one-size-fits-all approach work when it comes to technology. Each bank must examine its strategy and demographics to determine how best—and whether—to deploy ITMs. Cadence Bank installed ITMs in drive-up as well as interior locations but soon discovered its customers had a clear preference. “We’ve had much more success with the drive-up machines,” Lee says. In addition to learning where ITMs provided the greatest convenience, Lee says the Cadence Bank team encountered an unexpected issue during the deployment phase. “When we started, we didn’t have teleprompters,” he recalls. “The tellers, when they look at the screen, are not actually looking at the customer.” This didn’t provide customers with the best experience. 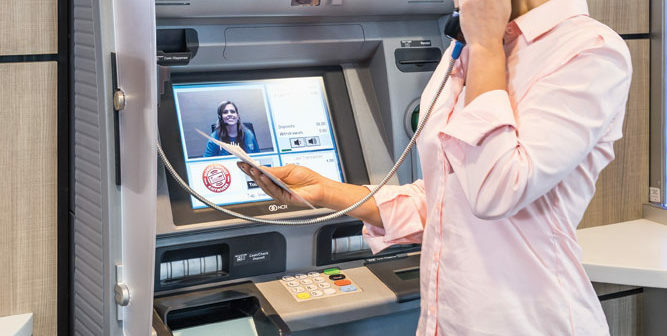 By adding a teleprompter, the financial institution quickly learned their tellers would have better eye contact with the customer, leading to better engagement. Staffing ITMs requires a different skill set from traditional counter-based transactions, as the teller doesn’t have the benefit of interacting with customers in person. “You have to make sure you have the right people,” Edwards says. “If you don’t, all it takes is a customer trying a machine one time and having a bad experience, and then they swear it off.” Edwards says his team has put together a solid recipe for ITM operators: tech-savvy tellers with good personalities and plenty of patience. Because United Bank employs the tellers working at its extended-hours call center to staff its ITMs, the ability to find those attributes in someone willing to work early in the morning and late in the evening is also important. Students at the local community college have proven to be valuable additions to the bank’s team. They’re generally comfortable with emerging technology and they’re also excited for work opportunities after normal business hours. A bank that chooses to add ITMs to its portfolio must be ready to devote the right resources to the project, both during launch as well as into the future. Interactive tellers blend multiple technologies, and Taylor believes they should have support from a range of internal groups. Fortunately, the bank was able to use existing common technologies to make ITM use easier for customers. YouTube-style instructional videos are available right on the machines, giving customers an easy way to see how the ITM process works. Edwards says his team has used print, online and even billboard advertising to make customers aware of the availability of ITMs. “After they’ve used it once, almost all of them embrace it,” he says. The feedback has been encouraging, particularly because the technology allows time-strapped customers to avoid racing to a branch while also reducing long lines near closing time. “Customers have a lot more time to get to the bank to deposit checks and do their banking business. It’s been a very positive thing,” Edwards says. With the amount of branch consolidation happening around the country, Castilla believes ITMs may be a viable option for other financial institutions, too. “We’re all looking for ways to stay connected using technology, without having the overhead related to branch operations,” she says.